Cleaning solar panels installed at large-scale solar plants in arid regions of the world is generally considered a necessary evil. Operators must clean the panels to meet energy production goals, but cleaning requires precious O&M resources in terms of increased labor, water and other costs. As a result, the number of cleanings is minimized to reduce costs. Adding insult to injury, manual panel cleanings require large crews in remote locations and can result in uneven, less-than-thorough results. Deploying crews during the day can compromise energy production, while deploying them at night may present safety risks and potential damage to PV equipment. SunPower has a smarter way: robots. SunPower’s unique robotic panel cleaning technology can increase energy yield at a lower cost than conventional cleaning methods, and with much fewer resources. It’s so hassle-free that owners can have the panels cleaned more often for the same or lower cost, increasing project yield by as much as 5 to 10 percent (depending on the location and climate) and helping to increase financial returns. Instead of putting an army of cleaners to work at your power plant site, imagine deploying a crew of three with just two robots and one truck. With these minimal resources, 45,000 panels — the equivalent of a 20-megawatt SunPower Oasis plant with SunPower E-Series solar panels — can be spotlessly cleaned in one 10-hour shift. That’s 20 times faster than manual cleaning, using 75 percent less water and with consistently thorough results. Even for larger plants in the heaviest soiling conditions, an owner would only need a handful of robots and workers versus hundreds of workers needed for manual cleaning, or thousands of the installed dry-cleaning robots that are used in some regions of the world. Only available for use with SunPower Oasis trackers, SunPower’s panel cleaning robots are a proven technology. Since 2013, they have cleaned more than 20 gigawatts, or enough solar panels to create a ribbon of photovoltaic panels circling the globe twice. Outmoded, inefficient and unproven panel cleaning methods can threaten a solar plant owner’s ability to optimize project yield and financial returns. Contact us to learn more about protecting and enhancing your solar plant investment with SunPower Oasis technology, including our breakthrough solar panel cleaning robots. 1 Based on preliminary field based on preliminary field measurements taken by SunPower at the Gala project in Oregon, USA. 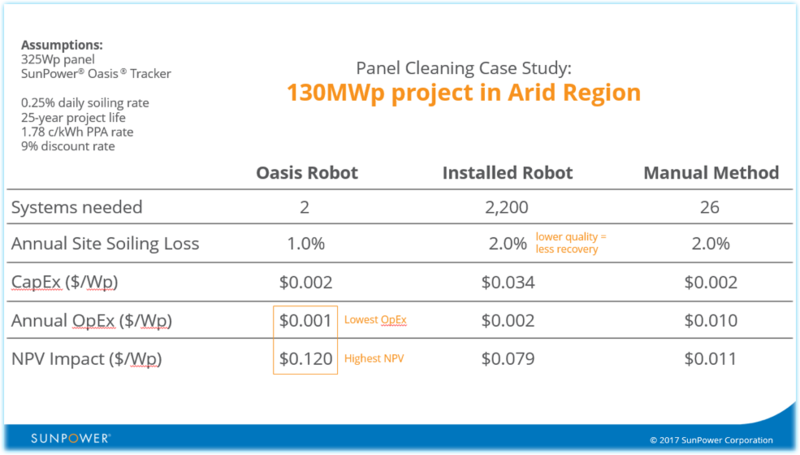 2 Based on experience with robotic cleaning at actual SunPower sites, compared to data tracked by subcontracted manual cleaners utilized at a SunPower project. 3 Lifetime cleaning data based on 2014-16 cleaning fleet activity at SunPower 1-axis tracker projects in the USA, China and Chile. SunPower internal case study from actual field results.